From hyperbaric chambers, to infrared saunas, to vibrating foam rollers, meet the latest and greatest recovery tools in NFL players' arsenals. In 2009, National Football League team owners launched an ongoing campaign to extend the regular season from 16 games to 18. To answer concerns about a potential increase in injuries with the additional games, they released a report showing a striking statistic: As the season went on, players actually missed fewer games due to injury. This trend became even more pronounced in the playoffs. New York Giants co-owner John Mara bluntly encapsulated the reason behind this stat when he told the New York Times, "In the postseason, players play." That expectation—that a player will overcome "minor" injuries and find a way to return to the field for important games—is as deeply engrained in football culture now as it was in the days of leather helmets. But how the players go about doing it has changed immensely. using an array of novel techniques. "Years ago, it was really just getting a cold bath, and you were lucky if you got any soft-tissue work," says Todd Durkin, a trainer whose clientele includes around 25 NFL players, including Drew Brees and reigning MVP Aaron Rodgers. "Athletes today are going into the season with a lot more understanding, so their tissue pliability is much better, and they're much less likely to get injured." 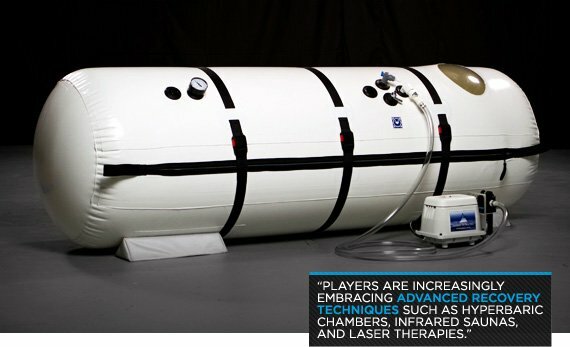 Players are increasingly embracing advanced recovery techniques such as hyperbaric chambers, infrared saunas, and laser therapies. In response, trainers like Durkin and Pittsburgh-based chiropractor Dr. Matt Burnett are packing their facilities with these devices. Once the whistle blows, players are willing to travel cross-country on a moment's notice to receive treatment. In the case of hyperbaric chambers, patients even bring the device on a road trip to turn a hotels into mobile clinics. "A lot of times, I'll hear, 'I can tell you're a great chiropractor, but on top of that, can I get this?'" Burnett says. "We have to stay at the forefront and be familiar with these techniques, because not only are they helping them play better, they're performing better at higher levels for a longer duration." If the new generation of recovery techniques shares a characteristic, it's that each aims to instigate and strengthen the body's natural healing processes, rather than simply patch a player's most dire injuries and send him back to battle. Trainers say this new focus has the potential to keep players healthy well beyond their playing careers, and may even make headway against the NFL's well-publicized problem with traumatic brain injury. Hard-shelled hyberbaric chambers have been used in hospitals for many years. They are common treatment for patients recovering from a range of serious afflictions including severe burns, pulmonary embolisms, and carbon monoxide poisoning. The FDA approved the first soft-shelled portable chamber for home use 12 years ago, and since then, hyperbaric usage has exploded among professional athletes. Michael Phelps has admitted to sleeping in a chamber, and Phil Heath has said his in-home chamber was his "hidden secret" in his title run for the 2011 Mr. Olympia. Chambers have perhaps their most intense supporters among NFL players. "My cell phone looks like a 'who's who' list of the NFL," says Bill Schindler, who operates one of the first hyperbaric clinics, the Hyperbaric Therapy Center outside of Atlanta. The website at Schindler's clinic counts 150 current and former players among his clientele. Recently, Schindler provided chambers to the U.S. Track and Field Team in London, as well as to golfers and caddies at the U.S. Open. He also serves a steady stream of non-athletes recovering from strokes, brain injuries, Parkinson's, multiple sclerosis, diabetic foot ulcers, and even autism. The appeal to all of these patients is the same. By increasing the pressure to higher than normal levels—around the equivalent of being around 11 feet underwater—a chamber allows a patient to more effectively absorb and transport oxygen around the body. "It's really simple: The hyperbaric chamber allows red blood cells to absorb more oxygen," Schindler says. "Once that happens, the excess oxygen dissolves into the plasma, so it brings blood flow and oxygen to all tissues, organs, glands, and the bones of the human body, all at one time, from head to toe." Players say this profusion of O2 translates to faster recovery from injuries, decreased inflammation, and a boost in overall energy, similar to when athletes train at a higher elevation. "Every single guy I've put in the hyperbaric chamber has gotten better to some extent," says Burnett, who provides hyperbaric chamber therapy to about 20 NFL players per week in his clinic, in addition to providing portable chambers to Pittsburgh Steelers players' hotel rooms. "Say you've got a lineman whose ankles aren't moving. He'll come out in an hour and say, 'That ankle is popping; it's feeling good.' A lot of fatigue, soreness, and general aches and pains are gone almost instantly." Schindler recently gave a presentation to the NFL Players Union concerning the potential benefits hyperbaric therapy can provide to treat concussions and prevent traumatic brain injury (TBI). This is a relatively new area of research, but several studies have shown encouraging results, including one in 2009 where two injured Air Force pilots with mild TBI saw "rapid improvement of headaches and sleep disturbances, improvement in all symptoms and resolution of most symptoms … with most measures improving to pre-injury baseline levels." According to Schindler, NFL players have responded enthusiastically to his presentations. "We're able to cross the blood-brain barrier and deliver oxygen and blood flow to parts of the brain that we couldn't get to before," he says. "We've been preaching this for the last seven or eight years, and only now, it's finally getting some attention among the owners and the NFL." Low-level lasers are a more recent development than hyperbaric chambers, but they have rapidly earned support among both doctors and veterinarians. Lasers were initially used primarily to treat chronic neck pain and arthritis, but in recent years they've gained popularity for tissue injuries and even skin abrasions. Clinicians use a range of wavelengths, ranging from class III "cold lasers," which emit no heat, to class IV lasers, which emit some heat and are thought to be more effective for deep-tissue treatment. Both show some promise in clinical tests, but as with hyperbaric therapy, studies often end by declaring the need for more studies. According to Burnett, NFL players generally receive the treatment in the day or two after a rough game—the sooner the better, to allow for the healing process to get underway. "Lasers cause a biostimulation of the tissue, which accelerates the ATP to the RNA/DNA synthesis, so the cell multiplies at a much accelerated rate," he says. "We'll get in there with ultrasound/high volt and push away the inflammation and swelling. Then we'll actually go in with the laser and heal it right away. Injuries that would typically take two or three weeks to heal, we have them back and ready again for Sunday." Laser treatments are brief and non-invasive, generally running 5-10 minutes using a device about the size and shape of a showerhead. They are increasingly offered outside of hospitals by chiropractors and physical therapists, but don't hold out too much hope for your insurance company to show the same spirit of inclusiveness. Foam rollers are ubiquitous in gyms. They're so common it's easy to forget they only skyrocketed to mainstream prominence within the last decade or so. Countless trainers swear by them, and Durkin mentions rollers alongside eating right and stretching as foundations of athletic maintenance. "It's something I recommend people do every day," he says. "It's simple and it's effective. If you can take five minutes 2-3 times per day, it really can make a difference for someone who is trying to accelerate healing and recovery. If someone is in pain, then it's a must." The principle behind foam rolling—or other forms of "self-myofascial release"—is remarkably complex, given that it involves such simple and intuitive movements. In short, the pressure of body weight on the roller stimulates the golgi tendon organ, which is located at the junction of muscles and tendons and regulates muscle tension. Aside from those acute benefits, self-myofascial release offers many of the same claims as stretching or massage: improved muscular elasticity, pliability, and range of motion. The latter claim was recently supported by a study at the School of Human Kinetics and Recreation at Memorial University, which determined that self myofascial release "significantly enhanced" knee joint range of motion in a group of healthy, active male subjects without causing any decrease in muscle power or performance. Of course, foam rollers don't have the market cornered on self myofascial release. Myofascial release balls—or two tennis or lacrosse balls in a tied-off sock—can achieve basically the same effect, and can actually provide deeper, more direct pressure for those who can handle it. But be warned: Many strong men have been brought to tears by a well-placed tennis ball. 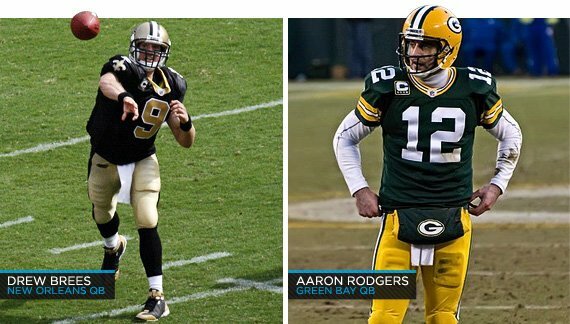 Chiropractic care isn't a novel recovery technique in the NFL—it's the norm. Every NFL team has at least one official chiropractor, and after the Super Bowl, he or she receives a ring right along with the players. Football chiropractors average 30 to 50 treatments during the week during the season, and many players seek extensive additional bodywork on their own. "All of the guys I initially saw were chiropractic patients long before they were hyperbaric users and class IV laser users," says Burnett, who was a collegiate strength and conditioning coach before becoming a chiropractor. Increasingly in recent years, both he and Durkin say they mix and match therapies and styles of bodywork to meet the symptoms presented by NFL players. ART: Active Release Technique, or ART, focuses specifically on treating overused muscles and overuse conditions. Providers use their hands to apply precisely directed pressure and advocate specific movements to break up scar tissue and relax muscles. Graston: A relatively new system currently used by 14 NFL teams, the Graston Technique uses a set of six stainless steel tools shaped to "comb over" various parts of the body in search of tissue abnormalities. When the tool catches on scar tissue or other adhesions, the practitioner works with the tool to break them up. Rolfing: Rolfing's domain is the fascia and other connective tissue surrounding muscles. Practitioners use their hands to manipulate tissues on clients in lying, sitting, and standing positions, in the thought that more supple connective tissues will allow the muscles to better work together in concert. Rolfing also incorporates a more overt philosophical component than the other techniques listed here. Cupping: By far the oldest of these techniques, cupping was used in ancient Greece, Egypt, and China, and has been spread globally in a variety of forms ever since, often in combination with controlled bloodletting. Practitioners use heat to create a vacuum in glass or plastic bulbs or cups, and place the bulbs to create localized suction on the patient's skin. The goal? With a technique this old and this widespread, good luck picking just one. Gory YouTube videos abound, each espousing a different benefit. Infrared saunas take the technology used to keep newborn babies warm and wrap it in a deluxe wood and glass artifice fit for multimillionaire athletes. Conventional saunas heat the air around a person, but infrared saunas heat the person directly with infrared rays that can penetrate more than two inches into the body. This translates to more sweating, but also less risk of being burned or overheated than conventional saunas, according to infrared supporters. Burnett likens the sauna to a full-body laser treatment, encouraging faster healing with the added benefits of detoxification and a boost in metabolism. He says it's a standard feature of his recovery protocol for NFL players, usually in approximately half-hour sessions taking place three times per week for 3-4 weeks. "We're kind of inducing a controlled fever, in a way," he says. "It increases ATP within the cells, so it's going to illicit the release of growth hormone by increasing muscular hypertrophy. It's also great in terms of calcium retention, so they don't get as much cramping. You jump in the sauna post-workout, and you're actually going to promote additional nitric oxide release, which is going to push more blood flow to the periphery and actually promote muscle building." Infrared saunas have gotten significant mainstream press attention in recent years for claims that they can reduce blood pressure, and that a single half-hour session can burn upward of 500 calories. Burnett says the latter claim has makes the saunas especially popular among NFL linemen looking to slim down prior to training camp. Word travels fast in the NFL, and techniques can gain a following overnight. Pittsburgh Steelers linebacker James Harrison captured the results-obsessed mindset of players when he told ESPN in an interview about his hyperbaric chamber, "You could tell me, 'Play with a snake until it bites you, and it [will] make you play better.' And if I go and play with that snake and it bites me, and I feel good the next day, and I play better, I might do it every week." Nevertheless, the trainers with whom I spoke indicated that the most promising recovery innovations right now involve modifications of the items already listed. Durkin says he knows players who have converted their entire bedrooms into hyperbaric chambers, at significant cost. 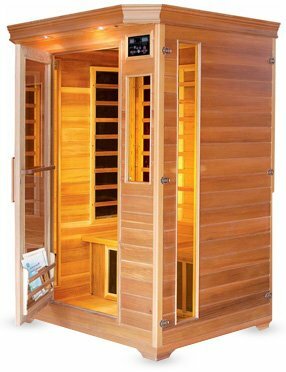 On the other end of the spectrum, infrared sauna manufacturers like Sunlighten have begun to sell portable infrared saunas. Burnett says he is also "in the works" on a device right now that will provide the same benefits as advanced bodywork, allowing therapists to "increase muscle length and reduce soreness and recovery time." Some of the most interesting innovations are happening to the simple foam roller. 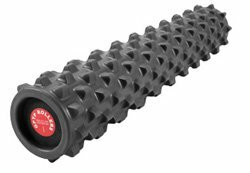 A number of years ago, the company Trigger Point released the Grid, a high-end foam roller whose hollow core and textured surface made it easy to spot in NFL preseason training footage. GoFit and RumbleRoller have also released rollers with bumpy or studded surfaces. Trigger Point more recently offered up the Cold Roller, a small, stainless steel device about the size of a rolling pin that is stored in the freezer prior to use. Another logical upgrade comes via Better Sports' VibraRoll, which does exactly what it sounds like. It has the shape and size of a normal roller, but hides a battery-powered vibrating cartridge in its hollow core. The device is not scheduled be released until next spring, but Durkin says he recently tried a prototype on his NFL players and the response was immediate and enthusiastic. "Once we hear about anything new like that—and it's anecdotally at first—then we'll investigate it," he says. "If we think it could work, I'll try it on myself, or the trainers will try it. If it seems to be valid, we'll try it with our athletes and get their feedback. Within 10 minutes, they were like, 'This thing is legit!' That means a lot to me. If they're telling me this thing gets in deeper, and gets them looser, then that goes a long way in my book."